Bring a sense of style to every adventure. Stand out with all-new 15-in. 8-spoke machined alloy wheels with dark-gray-painted accents. Details like this ensure you’ll always roll up in style. Four passenger doors and a large rear liftgate help you and your friends get in and get going with ease. Load up for a road trip, a big move or even a long hike with your best friend. Prius c makes it easy for you to explore new places and bring everyone and everything along for the ride. No problem fitting your gear, your crew, and your dog in the car. Prius c has plenty of room, thanks to the available 60/40 split fold-down rear seats. Not just 17.1 cu. ft. of cargo volume, but also a variety of ways to configure it. 1 Now you can pack even more fun into every journey. Prius c is the perfect road trip partner thanks to its available Entune™ Premium Audio with Integrated Navigation 2 and App Suite, 3 comfy seats wrapped in an eye-catching available two-tone interior fabric, and an available moonroof to let the outside in. Get in and out of the tightest spots on your next getaway. Prius c has your back with its standard integrated backup camera. 1 Shift into Reverse and the large display automatically shows what the camera detects behind Prius c, helping you avoid objects that might otherwise be out of view. It’s easy to unlock all the fun with the available Smart Key 2 fob in your pocket or purse. Simply grasp either the driver’s or front passenger’s door handle of your Prius c to unlock it. Plus, you can start the engine with the push of a button and start your next journey with ease. Chilly mornings are no excuse for missing out. Give your Prius c an added touch of comfort with available SofTex®-trimmed seating with heated front seats. Plus, you’ll enjoy a frost-free view with available heated power outside mirrors. Always stay in the know when you’re on the go. The Multi-Information Display (MID) shows the important data needed to help maximize your efficiency – including cruising range, fuel economy, and EV driving distance. It’s time to get more value and fun from every trip. 1 The backup camera does not provide a comprehensive view of the rear area of the vehicle.You should also look around outside your vehicle and use your mirrors to confirm rearward clearance. Environmental conditions may limit effectiveness and view may become obscured. See Owner’s Manual for additional limitations and details. 2 The Smart Key System may interfere with some pacemakers or cardiac defibrillators. If you have one of these medical devices, please talk to your doctor to see if you should deactivate this system. Enjoy more savings so you can create more memories. Thanks to its EPA-estimated 43 mpg highway and 48 mpg in the city, 1 Prius c delivers a more efficient drive. Now you can pull over for more photo ops and fewer gas stops. Take charge and pick your perfect drive mode. Prius c’s EV Mode enables electric driving for up to one-half mile. 2 ECO Mode limits the operation of the climate control and adjusts throttle input to help maximize fuel economy and give you more moments from each mile. 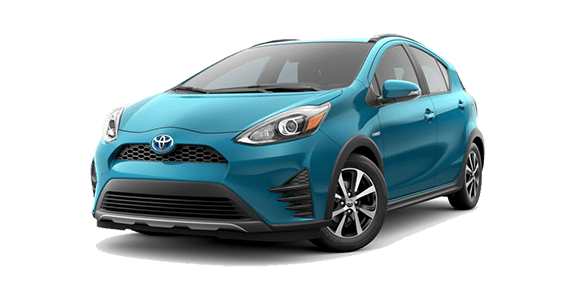 Rated as a Super Ultra Low Emission Vehicle (SULEV), 3 Prius c produces fewer smog-forming emissions than an average gasoline-powered new vehicle. Once you know how much you may be saving, you may know how much more you can spend on that commemorative truck-stop coffee mug from your next adventure. Prius c’s ECO Score display rates how efficiently you’re driving in three different categories – starting, cruising and stopping – to help boost fuel economy and improve your technique behind the wheel. Prius c comes standard with nine airbags, including a driver and front passenger Advanced Airbag System.1 In the event of certain collisions, a sensor designed to monitor the severity of the impact makes adjustments for the appropriate airbag deployment. There’s a lot of energy released in an impact. Prius c is equipped with energy-absorbing crumple zones that help dissipate that energy away from the passenger compartment. Bring your music along for the ride with available Entune™ Premium Audio with Integrated Navigation1 and App Suite.2 Equipped with the tech you know, this smart multimedia system helps you locate your car, enjoy live radio stations with iHeartRadio, and Yelp® the perfect restaurant. And with real-time traffic info, getting to the fun is easier than ever. Standard Bluetooth®3 wireless technology keeps you connected to your friends and favorite playlists, so you never have to miss a call, or your favorite road trip mix. It’s just one more way Prius c helps you stay in touch with your world. Put an end to the power struggle. Charge your favorite device and sync your music to Prius c’s audio system with the standard USB port.4 There’s also an auxiliary audio jack that supports a wide range of music players, so your favorite playlist is never out of reach. 3 The Bluetooth® word mark and logos are registered trademarks owned by Bluetooth SIG, Inc., and any use of such marks by Toyota is under license. A compatible Bluetooth®-enabled phone must first be paired. Phone performance depends on software, coverage and carrier. 4 May not be compatible with all mobile phones, MP3/WMA players and like models.